John Brown was a charismatic, stubborn abolitionist who failed at numerous business and commercial enterprises, yet succeeded in convincing men to join him in a cause for which they were willing to die. His abolitionist beliefs translated into violent actions in Kansas and Harpers Ferry, Virginia. Convicted of murder and Treason for his raid on military facilities at Harpers Ferry, Brown was hanged for his crimes. Nevertheless, he galvanized the abolitionist cause, becoming a martyr in the fight against Slavery. Brown was born in Torrington, Connecticut, on May 9, 1800, to Owen and Ruth Brown. His father, a strict Calvinist, despised slavery. When Brown was five years old, the family moved to Hudson, Ohio, a locale that was steeped in anti-slavery sentiment. Brown's fervor for the anti-slavery movement never waned and grew more vehement as he got older. In 1820, Brown married Dianthe Lusk and six years later, they moved to Pennsylvania where he started a tannery. Lusk died in 1832, leaving Brown with five children. In 1833, he married 16-year-old Mary Ann Day who bore him seven more children. Brown and his growing family moved around the country while he tried his hand at a number of occupations, including tanner, farmer, cattle broker, and wool merchant. In 1835, Brown's attempts to support his family and to repay money he had borrowed led to a disastrous "get rich quick" scheme. He convinced family members and friends to loan him money that he used to buy property where a canal was to be built. His timing proved unfortunate. In the wake of the Panic of 1837, plans for the proposed canal were changed and the properties bought up by Brown and his associates were rendered nearly worthless. Brown made numerous other attempts to reach financial solvency, but ultimately was forced to declare Bankruptcy in 1842. Throughout his life Brown remained committed to the anti-slavery cause. Brown met the great abolitionist leader Frederick Douglass in 1847 and impressed Douglass with his sympathy for African Americans—both slaves and freemen. In 1849, Brown moved his family to the black community of North Elba, New York. Brown proposed to show the residents of North Elba how to farm and to act as a mentor to them. Brown was a participant in the Underground Railroad, an informal network of exslaves and sympathetic whites that helped slaves escape their masters and travel north to freedom. In 1851, he proposed the establishment of the League of Gileadites, an organization that would be used to protect escaped slaves. In 1854, Congress passed the Kansas-Nebraska Act, which called for the residents of the new territories to decide the issue of slavery by popular vote. The area became known as "bloody Kansas" as competing groups fought violent skirmishes aimed at securing the territories for their side. Many pro-slavery residents of Missouri moved across the border in hopes of securing a victory at the election. "I believe to have interfered as I have done … in behalf of His despised poor, was not wrong, but right. Now, if it be deemed necessary that I should forfeit my life for the furtherance of the ends of justice … I submit: so let it be done"
Five of Brown's sons had moved to Kansas and they entreated their father to join them. In 1855, Brown moved to Kansas and began to plan for the armed conflict he felt was inevitable. In 1856, in response to escalating incidents including the sacking of the anti-slavery town of Lawrence, Kansas, and the near-fatal beating of U.S. Senator Charles Sumner who was attacked on the Senate floor by a pro-slavery congressman, Brown led a small band of men to Pottawatomie Creek, Kansas, where they killed five pro-slavery settlers. This violent action by Brown was hailed by a number of anti-slavery groups and universally reviled by pro-slavery forces.In December 1858, Brown and a small group of followers staged a raid on two pro-slavery homesteads in Missouri where they succeeded in confiscating property and freeing 11 slaves. Brown and his group then traveled more than a thousand miles to deliver the former slaves to a boat that would carry them to freedom in Canada. Although many abolitionists were opposed to violence, others had begun to adopt Brown's view that armed conflict was necessary in order to achieve the Abolition of slavery. Between 1857 and 1859, Brown crisscrossed New England, giving rousing speeches to anti-slavery groups and raising money for the abolitionist cause. Among those who gave money were the Secret Six, a group of wealthy benefactors from Boston who helped Brown by funding the army he sought to lead in order to further conduct his war against slavery. On October 16, 1859, the 59-year-old Brown led his Provisional Army, consisting of five black men and 21 whites (three of them his sons) in a nighttime raid on the town of Harpers Ferry, Virginia. Brown and his men cut telephone wires, took several hostages and gained control of the federal armory and arsenal. Brown's plan was to arm slaves with weapons from the arsenal, thus enabling them to fight for their freedom. However, he and his group found themselves pinned down by a group of local citizens and nearby militia groups who killed a number of his men including two of his sons. … I believe to have interfered as I have done … in behalf of His despised poor, was not wrong, but right. Now, if it be deemed necessary that I should forfeit my life to the furtherance of the ends of justice, and mingle my blood further with the blood of my children, and with the blood of millions in this slave country whose rights are disregarded by wicked, cruel, and unjust enactments, I submit: so let it be done. Brown was hanged in Charles Town on December 2, 1859. On the day of his execution, guns were fired and bells tolled in many northern cities. Brown was hailed as a martyr of the abolitionist movement, which concluded that a peaceful solution could not be found. In April 1861, Confederate forces fired on Fort Sumter, an action that marked the beginning of the Civil War. In 1865, Congress passed the Thirteenth Amendment, which abolished slavery throughout the United States. DeVillers, David. 2000. 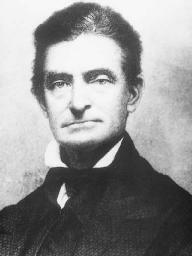 The John Brown Slavery Revolt Trial: A Headline Court Case. Berkeley Heights, N.J.: Enslow Publishers. "John Brown's Holy War." PBS: The American Experience. Available online at <www.pbs.org/wgbh/amex/brown> (accessed June 18, 2003). Lubet, Steven. 2001. "John Brown's Trial." Alabama Law Review 52 (winter): 425–466. Oates, Stephen B. 1984. To Purge This Land With Blood. Amherst: Univ. of Massachusetts Press.Peterson, Merrill D. 2002. John Brown: The Legend Revisited. Charlottesville: Univ. of Virginia Press. The hotel's rich history--which includes visits by just about every sitting president, not to mention Molly Brown, John Wayne, and the Beatles--comes to life in a new book, The Brown Palace: Denver's Grand Dame. But 22-year-old Roche has had limited opportunities to show manager Sir Alex Ferguson he can emerge as a serious threat to United's established defenders Wes Brown, John O'Shea and the Neville brothers. Groomsmen were Robert Earl Aidridge, Leigh Rhodes Brown, John Phillip Moss, Slater Gordon Parker, Jonathan Lane Smith, and Matthew Dimmick Williams. The only other confirmed Hoyts title is "Dirty Deeds," an Aussie comedy starring Bryan Brown, John Goodman and Toni Collette, produced by sister company Nine Films & Television. There must have been over 40 racers running cones, including guys like Beau Brown, John Gilmour, Don Bostick, Gary Cross, Cliff Coleman, the O'Shei brothers, Joe Woodman, world class longboarder Brad Edwards, and vert skater Ben Schroeder. So if you want to read the names of Earl Warren, Pat Brown, John Steinbeck or Upton Sinclair, look to the libraries. According to Lesley Brown, John Griffin and Charles Bates of UAB, when studying the bottom-pour ladle, nozzle throttling to control the pour rate actually increased the amount of air entrained. Behrman, Sidney Howard, Robert Edmond Jones, John Dos Passos, John Mason Brown, John V.
Tavish Scott said it was vital the party's "big hitters" such as Gordon Brown, John Reid and George Robertson get more involved in the referendum debate to win votes in Labour heartlands. IN the North West Counties League's Premier Division, AFC Liverpool blanked Abbey Hey 4-0 thanks to goals from Paul Brown, John Lawless with a penalty, Liam Loughlin and Steven Jones. Massey Ferguson, Ford, David Brown, John Deere a Claas i enwi dim ond rhai o'r cesig haearn ffyddlon sy'n cael sylw gan y cyflwynwyr.